Advanced Football Analytics (formerly Advanced NFL Stats): Is the Revolution Over? Did We Win? Is the Revolution Over? Did We Win? "The Revolution Was Televised. 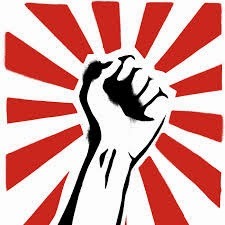 The fourth down revolution is over. Going for it won." "-The Lions going for it on 4th-and-goal from the two-yard line, early in their win over the Cowboys. -The Dolphins going for it on 4th-and-1 from the Patriots' 38-yard line, in the second quarter. -The Patriots going for it on 4th-and-4 from the Dolphins' 34-yard line, while leading by three points in the fourth quarter. -The Bengals going for it on 4th-and-inches from the 1-yard line, while leading 14-0 against the Jets. -The Broncos scoring a 4th-and-goal touchdown to tie the game at 21 against the Redskins, in the third quarter. -The Packers converting a 4th-and-3 from their own 42-yard line, setting up a touchdown to increase their lead to 31-17." I think Mike is right to point out some very interesting cases where coaches are making some notable decisions, but the revolution is far from complete. I would suggest that an avalanche is the better analogy than revolution. One day there may be an avalanche of aggressive 4th down decisions, but right now we're only seeing a few rocks trickle down the mountainside. It's not that there haven't been bold examples of enlightenment. It's just that there are so many opportunities that coaches have spurned. It's not easy to measure how well aligned coaches are with the numbers on 4th down, but I think I have finally stumbled on the right metric. We could just look at how often coaches go for it, but that ignores the effects of to-go distance. If we factor that in, we still need to consider field position. And even that ignores the effects of time and score. So the best tool available for this kind of analysis is Win Probability, which takes all those things into account. During every game, my system automatically estimates the WP of punting or kicking a FG and compares with the estimated WP for going for it. In cases where the WP of going for it exceeds kicking or punting, let's call that difference WP Available. In cases where there is WP Available on 4th down but the coach kicks or punts, I call the difference WP Forfeited. When the coach goes for it, let's call it WP Not Forfeited. To evaluate whether coaches are improving their 4th down decisions, we could compare the total league WP Forfeited from season to season. If it's declining that would suggest better decisions. Unfortunately, that doesn't account for the number of opportunities, particularly high leverage opportunities. 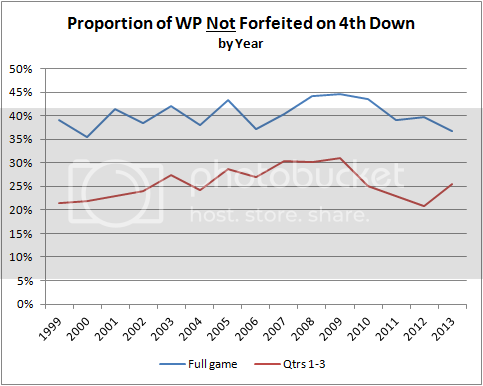 So I believe the best measure for evaluating how well coaches are doing on 4th down is the proportion of WP Not Forfeited to WP Available. This measure accounts for distance to go, field position, time, score, and opportunity. If coaches are improving their decisions, we should expect the proportion of WP Not Forfeited within the WP Available to be increasing. But's it not, although only slightly and not significantly in the context of recent history. 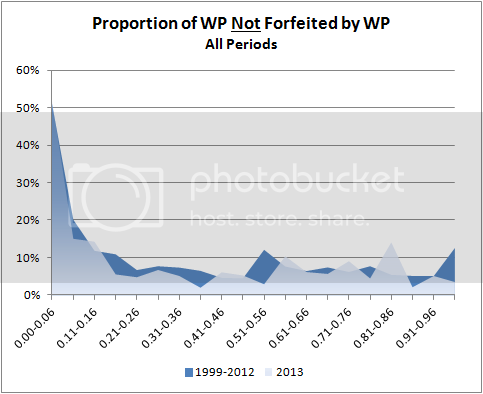 The chart below plots the Proportion of WP Not Forfeited by season. The red line includes 4th downs in the 1st through 3rd quarters only, and the blue line includes all 4th downs from all periods. We can look at things in another way. 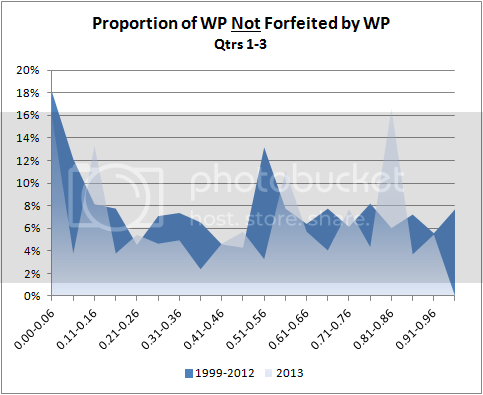 Here is the Proportion of WP Not Forfeited broken out by the offense's current WP. The more desperate an offense is, the more often we'd expect to see them go for it. And that's what we see. I've broken out 2013 (light blue) from the rest of the era (dark blue), and there doesn't appear to be any revolution to note. Here is the same plot, but limited to just the first three quarters when going for it on 4th down is typically against convention. Again, not much in the way of an increase. Here's one more way to skin the cat. If coaches are being more aggressive, we might expect to see an increase in the typical distance to go on 4th down conversion attempts. 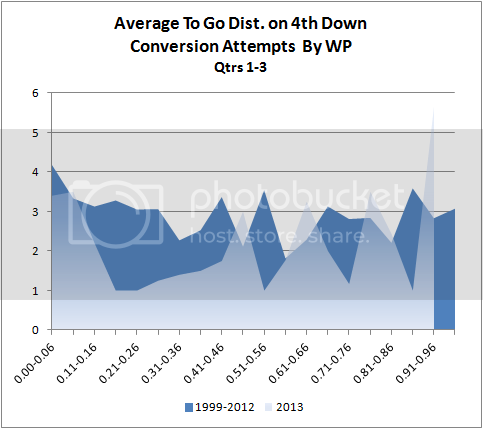 But if anything, the average distance to go on conversion attempts has decreased for 2013. Data are from all 4th downs from the 1999 through 2013 season (through week 8). I didn't see a revolution last night when Belichick kicked a field goal on 4th and 1 from the 8 to go up 3 with 7 minutes left. The 4th down calculator said going for it was slightly favored per WP, but I hope Belichick was second guessing himself when the Panthers scored a touchdown on their subsequent possession. Punting is offensive failure. The teams that punt the least win the most. Yeah, none of the situations in Tanier's article come across to me as going against the existing paradigm. They're either 4th downs in no man's land or goal to go. situations where savvy coaches have been going for it for ages, even when leading. There are definitely still coaches that would punt or kick the FG in those situations, so these decisions are commendable, but not worthy of being called a "revolution". I didn't look them up on the calculator, but I'm pretty sure Cleveland had a few howlers this weekend as well. I think it would also be an interesting excersise to check the ratio of "agressive" misstakes to "conservative" misstakes. If indeed the revolution has come you should have a number of instances where the model says kick but the coach chose to go for it that is at least in the same order of magnitude as cases when they chose to kick where the model says to go for it. Going for it is very risky, you only go for it if you're down by 3 TD's or there's only 2-3 minutes left in a game. Also, use of words like "unconventional" and "aggressive" muddles the analysis. Was Belichick Right to Take the Wind in OT? Brady vs. Manning: Who Really Has the Upper Hand? Do Comeback Wins Equal Future Regression? The Worst 8 - 0 Team of all Time?